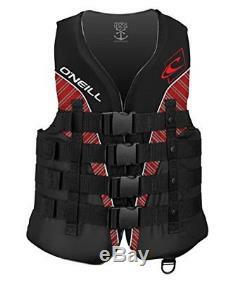 O'Neill Men's Superlite USCG Life Vest, Black/Graphite/Red/White, X-Large. 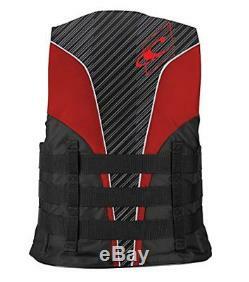 USCG Approved Personal Flotation Device; Perfect For Wake Sports, Waterskiing, Tubing, And Swimming. Minimal Bulk Design Allows Full Mobility. Durable Coated Polyester Shell Creates A Strong Exterior. Lightweight Polyethylene Foam Is Soft and Comfortable. 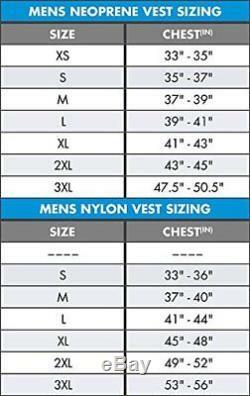 Our Most Relaxed Fitting Vest, For A Wide Variety Of Body Types. O'Neill designs the uscg approved vests to provide the best fit in the industry, setting new standards of expectations for all wake and waterski athletes. Any product you return must be in the same condition you received it and in the original packaging. We usually respond within 24 hours on weekdays. Thank you for shopping at our store. The item "O'Neill Wetsuits Wake Waterski Mens Superlite USCG Life Vest X-Large" is in sale since Saturday, May 12, 2018. This item is in the category "Sporting Goods\Water Sports\Swimwear & Safety\Life Jackets & Preservers". The seller is "*reliabletrader*" and is located in Miami, Florida.